GP at Hand offers free 24-hour access to a GP, but what is it costing the NHS? To get an appointment at my local doctor’s surgery you must call on the day at 8am to snap up an emergency slot, no matter how mild – or severe – your illness. It’s not possible to book in advance; even for a routine check-up, this is the only way to see your GP. This isn’t unique to my practice, and across the country, waiting times are frustratingly long. It’s partly why a wave of online apps have appeared which offer 24/7 access to GPs via phone and video calls. The apps allow you to see an NHS doctor and have a prescription issued – in the same time it takes to sit down and have a cup of tea. One of the most well-known apps is GP at Hand, run by a private health company called Babylon. Founded in 2014, it now has around 40,000 members. It’s funded by the NHS and offers users 24-hour access to GPs every day of the year. Read on to find out exactly how it works, the costs involved, how it compares to going to your local doctor, and what impact it is having on the NHS. How does GP at Hand work? GP at Hand offers access to a GP at any time of the day, or night, for 365 days a year. The doctors available all work in NHS surgeries and the service offers free NHS treatment alongside paid-for private treatment. As well as digital and physical appointments it offers repeat prescriptions, which can be picked up at a chemist or sent directly to a patient, and specialist referrals. Appointments are free and usually take place on the day or the day after. Video conversations are recorded so patients can re-watch them afterwards. Those who register with the service switch from their current NHS practice to GP at Hand. In order to join, they need to be living or working within 40 minutes of one of five central London clinics. There are some restrictions on the patients accepted for GP at Hand and some people with complex medical needs won’t be able to sign up. Pregnant women or those with mental illnesses, for example, will need to register with a local surgery instead. The GP at Hand service is free, just like signing up to your local NHS surgery. There are also several private services available which are run by the parent company, Babylon. These operate on a paid-for subscription or you can make a one-off payment. Unlimited GP consultations cost £9.99 per month, a 12-month subscription is £89, and a one-off consultation costs £25. You may also be able to access the private service through your health insurance. Some insurers, such as Bupa, include it within their policies. GP at Hand offers a free NHS service and if you meet the conditions, it can be a much faster way of seeing a doctor. You’re no longer stuck with the choice between waiting weeks to see a doctor or calling on the day for an emergency appointment, and you don’t have to pay anything extra. There have been some negative stories around how GP at Hand’s technology works – especially surrounding its ability to detect certain illnesses. Dr Alex Ashman, leader of the National Health Action Party, said: “We know that the design of Babylon is flawed and that the quality of the diagnoses it provides to be dangerously off the mark. “Technology can work wonders in the NHS, but it has to be vetted properly, and in this case, that vetting is sorely lacking." In defence of this statement, a spokesperson from Babylon responded that Babylon's services are "continuously reviewed and assured by UK healthcare bodies including NHS England, the Care Quality Commission, NHS Digital and local NHS Clinical Commissioning Groups." Another drawback is the fact that patients must leave their traditional GP surgery to sign up with GP at Hand. If they are unable to be seen under the new service – such as if they become pregnant – they must go through the whole process of registering again at their local surgery. What impact is it having on NHS funding? NHS doctor’s surgeries are given a certain amount of funding per patient they have registered, which usually amounts to around £152 per year. Dr Richard Vautrey, committee chair of the association, said: “When predominantly younger, healthier patients, who tend to visit their GP infrequently, de-register from their local practice, vital funding is transferred to GP at Hand. “This means the original practice is left with fewer resources to treat older patients with complex conditions, who visit their GP most frequently, and crucially, for whom GP at Hand is completely unsuitable. 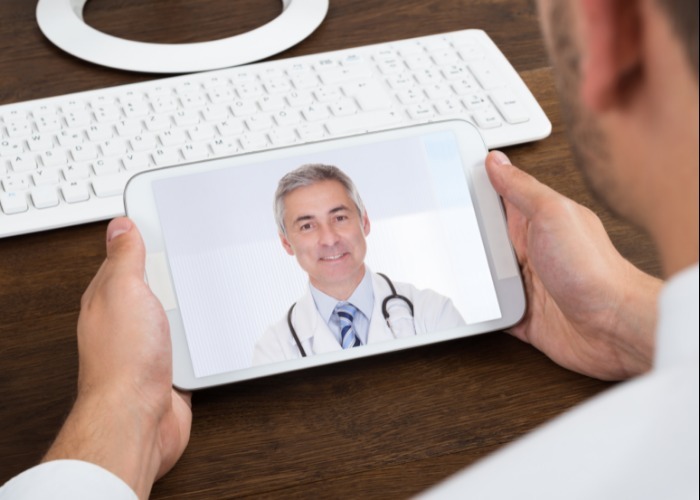 “Video consultations may be a convenient way for some people to see their GP, and most practices would like to be able to offer them to their own patients where appropriate.